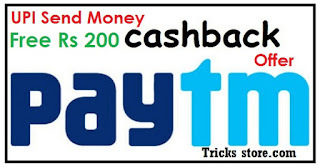 Paytm Best Offer, Paytm New Send Money Offer, Paytm UPI Cashback, Paytm BHIM UPI Cashback Offer – Hello guys now get assured cashback upto Rs 200 when you Send Rs 1000 via Paytm UPI address, Paytm UPI Offer. Paytm always comes with new Paytm offers & now they are giving best cashback on Send money via UPI handle, offer is as simple as the topic is. You have to send money through Paytm UPI and that’s it, you will automatically eligible for the cashback offer. You can get cashback of amount Rs 1 to Rs 200 on Transaction of Rs 1000 or more via @Paytm UPI Handle. Yes now you can earn paytm wallet cash by just sending money to other UPI address. You can try multiple times in a day to win higher cashback. So Hurry up buddies grab this loot deal now. 2. Now Install /Open the Paytm App on your mobile. 3. After that make Login/Sign up with your Paytm account. 5. Just after that Paytm will verify your Bank account. 7. Now again on Homepage >> “Bhim upi” >> Send Money >> and Enter ammount and address you wanna pay the amount via paytm upi handle. 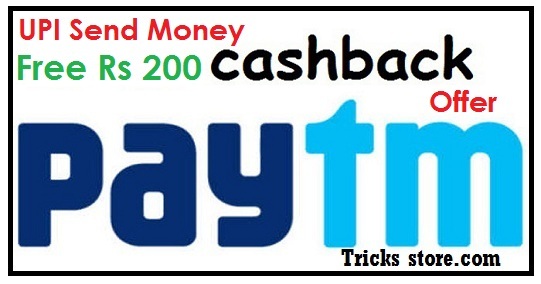 That’s it guys, You can get cashback of amount Rs 1 to Rs 200 on Transaction of Rs 1000 or more within 48 hours. * To avail this offer Send Rs 1000 to any Bank Account or UPI address. * The total winning Cashback will be credited within 7 days. * Cashback will be added to your Paytm Wallet directly.